Spread festive joy with Pezzo's new Christmas menu. We tried it, and we know it's love! Pezzo Pizza has specially created a series of unique mouth-watering dishes worthy of the Yuletide feast - Carbonara and Flamethrower Pizza. These creations by their very own chefs will set you and your guests' hearts aglow. Flamethrower is topped with a potpourri of tender spiced chicken, roasted onion, fresh chilli and mozzarella all immersed in Pezzo's special curry sauce. A must try if you are a lover of spicy food. Carbonara is a perfect option for those who can't take spicy. An enticing medley of roasted turkey bacon and ham, oregano chicken chunks, mushroom and mozzarella, all pulled together by creamy carbonara sauce. I love how it is tastefully sprinkled off with dried cranberries. Oh so Christmasy! Definitely a lovely choice for kids. I've got a low tolerance for spicy food, but I've to say I love the Flamethrower! Looks like we've got a food choice ready for Christmas. And delivery is all made easy with Foodpanda. Pezzo is located in prominent shopping malls around the Island. The newest outlet is nestled in Compass One, and it shares the space with two other eateries, Stuff'd and CRAVE. This is an interesting 3-in-1 concept that brings us on an around-the-world gourmet experience. Yes, with a sit in option too. Since pizzas are sold by slices at Pezzo, you will love the option of choosing up to 6 flavours in one pan. Love how you can get a taste of everything without having to buy the single flavour of one whole mega pizza. This boy of ours loves pairing his carbarona with chicken drumlets. Drumlets are a tad spicy, but he loves the kick of it. They kinda make us crave for more! The Christmas flavours, Flamethrower and Caborona are available from 01 December onwards, at $4.90 per slice. It's a huge decent size and best eaten when warm. How about an idea on what to lunch this Friday, 25th Nov? A slice of Pezzo! In celebration of their 4th anniversary, all pizzas are going at $4 per slice. So don't forget to jio your lunch buddies for this awesome lunch deal. Disclaimer: We were invited to a tasting and Christmas party with Pezzo. No monetary compensation involved. All opinions are photos are solely ours. Are you a frequent visitor at the National Library? We are! It is however only this recent that we started hunting and collecting book bugs! This initiative must be Pokemon inspired. Instead of using a device, walking everywhere to catch mons, we collect bugs by borrowing books. Each loaned receipt allows you to tikam for an envelop of 2 bug cards. If you have 5 members, like us, in the family (each has a card), you can get up to 10 cards. What do you do with these cards? There's a game to it, which we have yet to discover. Collection in process. There are a total of 84 cards to collect. 60 basic designs and 24 shiny designs. To collect basic cards, simply present the receipt of 8 loaned books at the redemption booth (Only up on weekends). To redeem shiny cards, we can attend a programme at the library OR submit a completed discoveRead activity sheet at the redemption booth. Mystery Items come in the months of June and November. We missed June and so we've no idea what this mystery is. We'll be doing it this month! 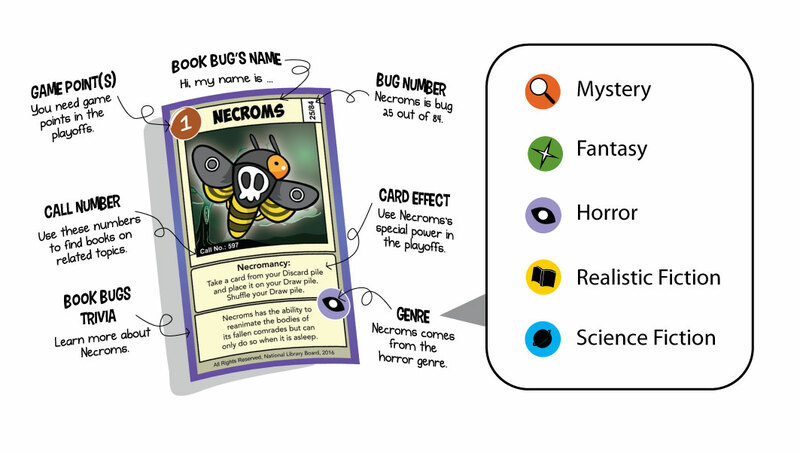 Complete the quiz at the bottom of the discoveRead activity sheet, and bring a matching book bug card to the redemption booth. So yeap, the same activity sheet for both shiny card and mystery item. And then, there's the playoff, where you can receive the limited edition book bugs badge. Join the playoff to battle against other Book Bugs collectors and stand to win a prize. Visit the different Book Bugs zones where you can catch a live demo of the Book Bugs game, mingle and trade cards with other Book Bugs collectors. Exchange the original Swap Pass at the Swap Pass booth or participate in the activities in the craft zone to redeem a Shiny Card that you missed. Registration required here. The original Swap Pass will be available at the redemption booth. This playoff is only open to the 7 years old and above. I have to applaud NLB's initiative with this buggy programme. It really did get the kids frequenting the library more! Instead of bi-weekly, till the loaned books due date bug us to return, we are going weekly. These book bugs will definitely send your kids bugging you for library trips! And remember, redemption booths are only up on weekends. At all libraries, except Chinatown, Esplanade, Orchard and Sengkang. But, if you happen to be there on a weekday for borrow, keep the receipt and come by to redeem on weekends! When do you start? Now! Collection began in June and only till December 2016. Never too late. The ultimate goal is not about completing the bugs collection, but the process of collecting and all parents will love... getting the kids excited about books! Over and over again. Another good things must share post. We gotta go catch them all now.... not Pokemons, finally. Over the weekend, we got ourselves enchanted and entangled in the all-time classic tale of Charlotte's Web presented by SRT, The Little Company. 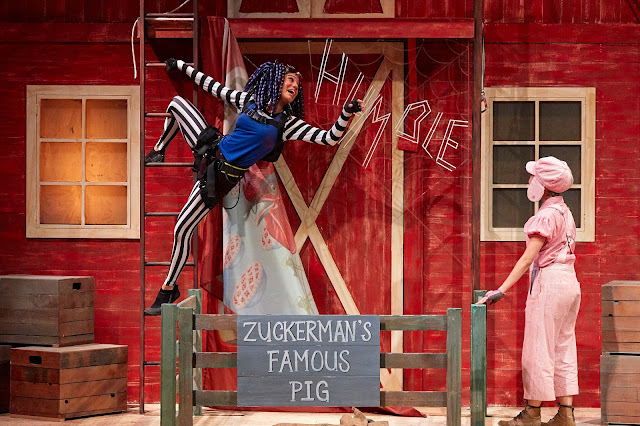 Charlotte is a barn spider that proved to be a true friend to Wilbur, the pig, by coming to his rescue when he was going to be sent to the butcher. With no idea how she could help, she gave her word of assurance that she will help Wilbur out of his destiny of death. When I first read of the story, I did doubt her ability to help, as she was just a tiny spider. Being small often holds the most unbelieving ability. With brilliant web-spinning skills, Charlotte weaved messages that convinced the farmer and villagers that he is no ordinary pig and he should to be saved. It worked! This extremely gentle story sheds kind wisdom about friendship, love, hope and grief. Yeap, kinda sad, but Charlotte had to die after laying her eggs. It is often conditioned in a child's story that everyone lives happily ever after, but maybe that is not how real life works. It is one good opportunity to explain that the life-cycle of a spider is complete after making egg sac. Her biological duty is fulfilled, and she dies. 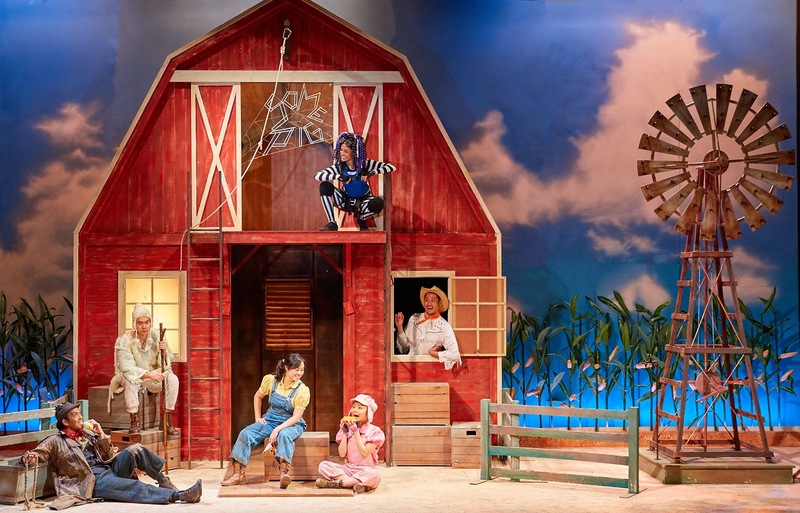 Though a heavy heart towards the end of the play, it was turned onto a happy note when the egg sac Charlotte left behind, hatched into hundreds of spiders - her children and grandchildren! It ended with a death, but also lots of births. 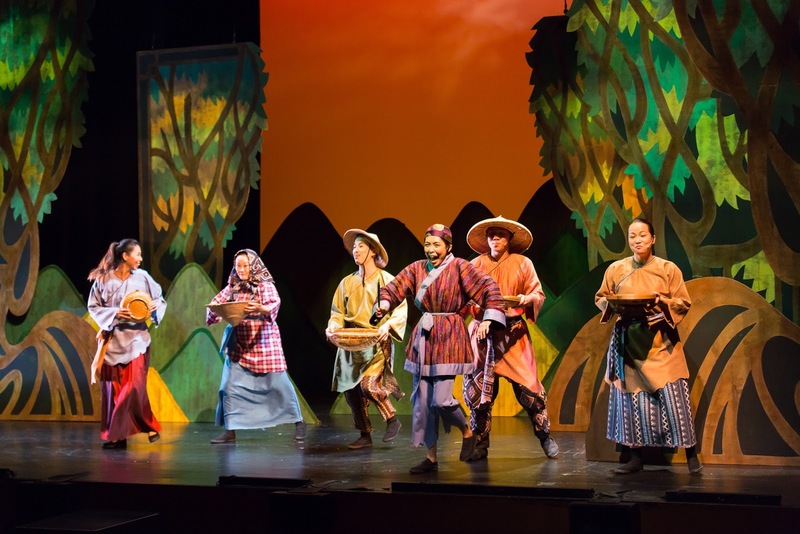 This is yet another lovely production by SRT, where every child and adult will love and celebrate the friendship displayed between the two. Not only did Wilbur find a friend, he too, found hope in the most dire situation. We learnt not only to receive kindness or take a friendship for granted, but that kindness begets kindness. Wilbur guarded Charlotte's egg sac till they hatched. It's not often that someone comes along as a true friend. We enjoyed this play very much and I specially loved the role played as Charlotte. It was very impressively portrayed with well choreographed moves that convinced and captivated the audience. 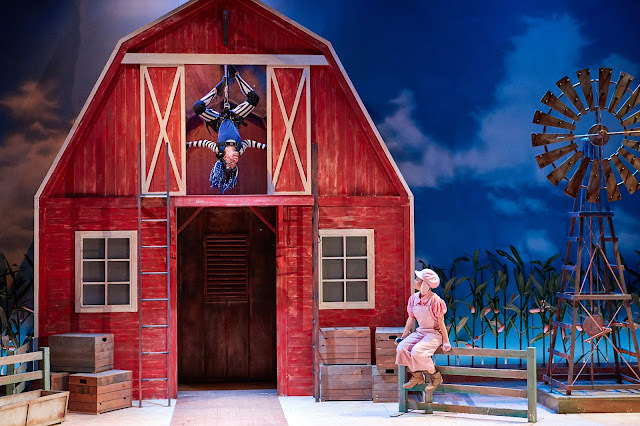 Clever stage props, like how the spider hung and crawled on the roof of the barn was definitely some mega effort put into the staging. World class standard, if I can say. This play is however much different from the usual productions. It is more conversational with little singing and dancing. Best way to bring out the essence of this story, I feel. A recommended age for watch would be 4 and above, when kids have a little more attention span to conversations. There really isn't much to hesitate about catching this play. The only valid reason to delay is because you had like your child to complete reading the book, if he has not. Other than that, don't miss this! Jazz came back and dug out her book for read again. We do want to re-watch the movie too! How nice to have caught this story in 3 various presentations. Disclaimer: We were given tickets for the purpose of this review. All photos, unless credited are solely ours. What would you paint if you had a magic paintbrush that brings life to the things you draw? Money! Many would say, but not for a poor boy who uses it to bless only the poor. In the folk tale of the Magic Paintbrush, a poor boy called Ma Liang, loved to draw. He was however too poor to afford a paintbrush. He drew on ground with stick, but if he had a paintbrush, he would paint pictures for poor people. One day, an old man appeared, held out a paint brush and gave it to Ma Liang. With it, he soon realised he could bring life to the things he drew. He began blessing the poor with the food and clothes they needed. It wasn't too long later that the story the magic paintbrush spread across China to the royal palace, and into the ears of the wicked and greedy emperor who taxes his people on anything and everything. He demanded Ma Liang to paint him gold. Ma Liang refused as he only paints for the poor. He was then locked up. 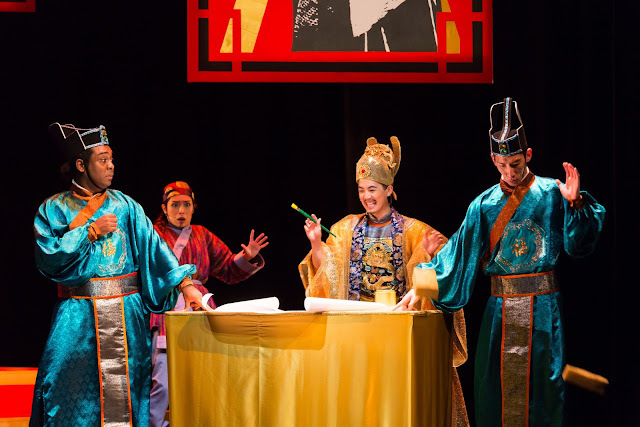 What would be the fate of Ma Liang and the wicked, greedy Emperor? With the help of friends, Ma Liang managed to draw a door for escape! But not with much success when he was caught again. The Emperor continued to demand Ma Liang to draw him an Island of gold and sail him on a boat to it. A boat made of gold! And along that journey, he asked for wind, but instead of wind, Ma Liang drew a hurricane. The ship was wrecked and he never came back. We love tales that live happily ever after. In the close to heart adaption by itheatre, a familiar local scene was introduced at the beginning. Toni Lee, a youngster from present-day Singapore was struggling with the pressures and stress of schoolwork and parental expectations. With an accidental wish while doodling, Toni quite unexpectedly met a Magical Paintbrush, and is transported back in time to a Southern Province of China, where, in a series of magical adventures, Ma Liang's story unfolds. Meet the wonderful casts along this magical adventures, especially the humourous pair of the Emperor's guards, Sotong and Shrimp who never fail to send the audience to stitches at every scene they appear. Through the endless fun and laughter, a clear and strong moral message about the value of creativity, friendship, and the dangers of using, or abusing power is presented in this magical, musical family show. Sometimes, wishing for the things you don't have can bring more trouble. I have to say, this is one of the best we have seen this far, by itheatre. It was Juboy's first theatre experience too! Though he slept through a part of it. We were very well entertained with desires of anticipation from one scene to another. Props, back drops and costumes were creatively made up. The team of talented cast was bigger than usual and more lovely tunes were weaved into the play too. 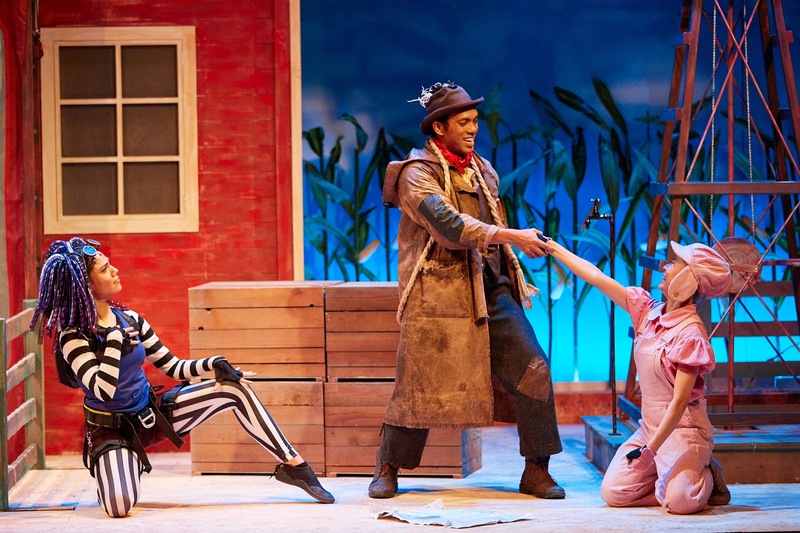 The clever use of beautiful puppets and fun interaction with the audience sent the kids into squeals of excitement. It was really enjoyable. Quite sure it will be an awesome theatre experience for every young and old. We say, this play is worth a catch. Definitely! The show is about 1.5 hours with a 15 minute interval. Disclaimer: We were given tickets for the purpose of this review. All opinions and photos (unless credited) are solely ours.